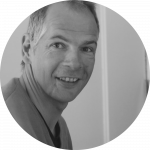 Gerard van der Poel - PGCert Sports Osteopathy | MSc. Ost. Drs. Gerard van der Poel is movement scientist, specialized in exercise physiology. Since 1993, he has been working from his own company Infomotion at the intersection of science and practice. Gerard is a very experienced and knowledgeable teacher in several (post-)academic courses in the field of exercise Physiology & Training. Gerard van der Poel is also (co-)author of 7 books and many articles in various professional journals. EenSome of these publications you can find here.